Masonry adds a timeless and aesthetically pleasing appearance to your property. The structures built from materials used in this architectural art form are made to last for years to come. Along with durability, masonry adds a hint of natural beauty which many cannot help but stop to admire. Todd Boston Masonry in Louisville, Kentucky, offers these services to residential and commercial properties. Before we begin, we sit down with our customers in order to learn exactly what it is they would like repaired or restored within their property. Our team is very well rounded in their knowledge of building structures. 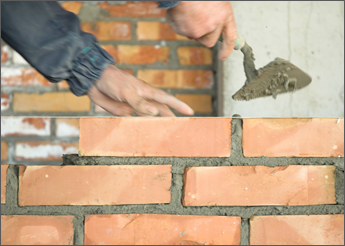 Our team can handle just about any masonry repair or restoration work you need done from your walls to your floors. We do not make any changes and do not begin cutting into your existing walls unless they are precise to your requests. Two common renovations that we are commissioned to do for homes are chimney repairs and flatwork. In the winter your chimney is often a place where your family will gather around to stay warm by the fire. Our team can make your fireplace and chimney one of your rooms' best features. We use materials that add an earthy feel to the inside of your home. Our flatwork offers your home or business a smooth surface that is durable and will enhance the value of your property. Through the use of stone or brick, we can create a variety of patterns that will offer an aesthetically pleasing appearance. This can be used both indoors and outdoors, creating coordination throughout your property.